The book of 1 Peter is very much a letter of comfort and encouragement, as Peter expresses his understanding at the trials that Christians of his time face. He encourages them to be steadfast in their faith and to take comfort in the grace of God, while reminding them to conduct themselves appropriately as Christians. I have always read the epistles of Peter with the images of his deeds cast heavily over my mind – this was the man who had denied Christ three times [Luke 22:61]! This was the man who had cut off somebody’s ear in the Mountain of Olives [John 18:10]! This was the man who had wanted to walk on water with Jesus and fell into the water [Matthew 14:30]! And yet, Jesus promised that on this rock I will build my church [Matthew 16:18] – the rock referring to Peter – Jesus had also said, but I have prayed for you, Simon, that your faith may not fail. And when you have turned back, strengthen your brothers [Luke 22:32] – Simon is Peter. We are reading the words of a Peter who has turned back to God, a Peter who is the rock foundation of the church, a Peter who strengthens his brothers. Amazing. I love the metaphor used in the KJV – Wherefore gird up the loins of your mind, be sober, and hope to the end for the grace that is to be brought unto you at the revelation of Jesus Christ. What is gird up the loins? In those days people wore long flowing robes, and if they wanted to run, fight, or do anything of consequence without falling down, they would typically bend down, grab the ends of their robes from between their legs, and tuck it in their belts, thus making the robe some sort of a harem pants in today’s terms. That is something they must do first if they wanted to run. In most other translations the metaphor is not mentioned – NIV for example simply says prepare your minds for action. Prepare our minds for what action? Later on Peter tells us do not be surprised at the painful trial you are suffering, as though something strange were happening to you [1 Peter 4:12]. Gird up the loins of your mind – prepare your minds to run, quoting Paul, toward the goal to win the prize for which God has called me heavenward in Christ Jesus [Phil 3:14]. Peter spent the first 12 verses extolling God‘s grace for the Living Hope – in his great mercy he has given us new birth into a living hope through the resurrection of Jesus Christ from the dead [1 Peter 1:3]. The word therefore tells us that this living hope mentioned in the first 12 verses is the hope he was referring to when he says in verse 13, set your hope fully on the grace to be given you when Jesus Christ is revealed. Hope fully – hope perfectly, have full assurance and confidence in the living hope of Christ, be perfect and steadfast in our hope and not hypocritical in it. Hope, without buts, hope, without ifs, because this living hope is worthy, it is unshakeable, it fully deserves our perfect hope in it. Whatever trials or suffering that may come your way, hope through it. Never give up your hope because of it. And our hope is in the grace of Christ. Completely. Not anything else. Not 90% on Christ and 10% on money. Fully, hope in the grace of Christ. Completely, every ounce of our being and consciousness should hope in the Lord, who is the living hope, the one hope [Ephesians 4:4]. Self-control is one of the fruits of the spirit [Gal 5:22-23]. Paul tells us not be like others, who are asleep, but let us be alert and self-controlled [1 Thes 5:6]. While I doubt he was referring to physical sleep, there are examples of people who fell asleep when they shouldn’t in the Bible, in a blatant act of lack of self-control. Peter himself, was one of those at the Mountain of Olives, sleeping when he should be praying. Jesus reminded Peter, Why are you sleeping? Get up and pray so that you will not fall into temptation [Luke 22:46]. Peter, John and James still slept though, and because they were not alert, they were in a frenzy when the betrayer came. In a state of frenzy, Peter infamously sliced off the ear of Malchus [John 18:10]. Of all people, Peter would know best the consequences of a lack of self-control. He would know best the consequences of not being alert, not preparing his mind for action, not girding up the loins of his mind. The consequences he bore were huge. Granted, Jesus would probably still have been arrested whether he was alert or not that day, but at least he could have kept watch and prayed while Jesus was praying. That alone would have offered some comfort to Jesus. That alone would have gratified Jesus, who had revealed that his soul is overwhelmed with sorrow to the point of death, and wanted them to stay there and keep watch with him [Matthew 26:38]. Instead they slept, and were more of an upset than a comfort to Jesus. From a man who has failed, from a man whose faith had wavered, from a man who repented and turned back to God – we hear a command that is not only rooted in truth, but perhaps also very personal. 1 Peter 1:13 was the first command that Peter issued out – he spent the first 12 verses extolling the grace of God. Imagine what he was thinking when he said, prepare your minds for action, be self-controlled. I wonder if the scene of the Mountain of Olives came back to his mind. I wonder if he remembered the ear of Malchus. I wonder if he remembered Christ looking straight at him the moment the rooster crowed [Luke 22:61]. Maybe, maybe not. This may be a command, as in, it is something Peter told us to do, but it is perhaps less of a command than it is a plea. Please do this! Don’t be like how I once was! Perhaps I have romanticized it, yes, I most likely did. Putting all the drama aside, putting the history of Peter aside, it is that straightforward, isn’t it? Because God is great and our hope in him is a living one, let’s prepare our minds for the race, be alert to the temptations and trials, be self-controlled and act in a way that a Christian should, and put all our hopes on the gospel. It is that straightforward. God has held out his grace to us, we only need to hope fully in response to it. 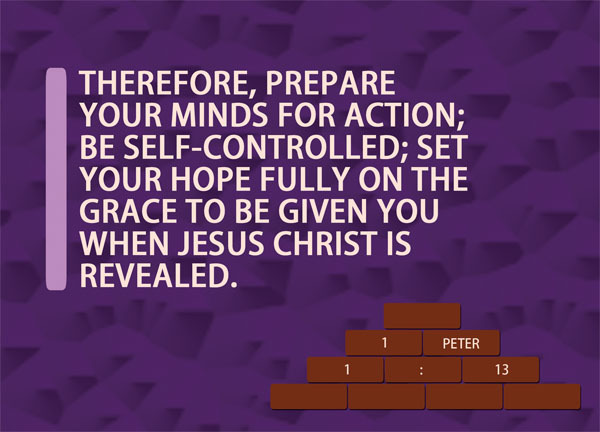 Peter commands us to first hope, and hope perfectly; second prepare our minds; third be self-controlled. It is that straightforward. It starts with hope. As always. i don´t think you romanticized it at all…that´s why God gave us their stories. to tell over and over again, and to learn. wonderful graphic, and yesterday´s was so powerful. i think there are those who saw it and remembered how wonderful it is to know Jesus…and so He weaves His truth from heart to heart, even in those who least expect it. love you! but above all, thank God for you. Amen. I love Peter and I love how you broke this word down. Thanks for sharing and I pray the Lord blesses you abundantly for your faithfulness in presenting His word.